Gifting is a wonderful way to communicate thanks, respect, or comradeship and can pave the way to success in the workplace. In order to create the perfect custom corporate gift in San Francisco, tailored to your individual needs, we design bespoke gifts. This means that your unique wants are assessed at each step in the process of bringing your custom corporate gift to life. 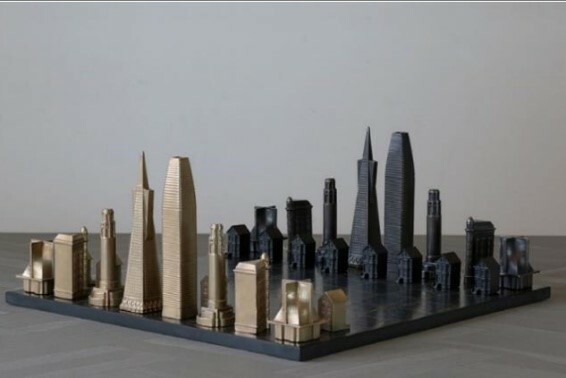 Our chess set, seen here, is comprised of some of the most notable buildings in San Francisco. Need a custom corporate gift with a San Francisco twist? At Keith Lipert, we customize gifts based on the specifications requested by each client we work with. We’ll work with you to create a gift that sends a specific and positive message to its recipient, while also conveying the thoughtfulness put into it. The experts at Keith Lipert can work with a variety of budgets and timelines to fit your schedule. Our gifts range from business card holders to sophisticated and personalized items that reflect your company’s vision. The presentation of your San Francisco custom corporate gift is equally important. Both your personal tastes and the circumstances in which you are giving your custom corporate gift work to set the tone in a recipient’s mind. While the right presentation of a corporate gift can convey respect and comradeship, the wrong presentation can take away from the thoughtfulness and time which was put into the gift. That’s why we are dedicated to working with you to strategically plan and craftily execute the presentation of your gift. It’s important to design your custom corporate gift with someone like Keith Lipert Corporate Gifts, who have been in business for over 30 years. Our experts have decades of experience in creating the perfect custom corporate gifts in San Francisco. Whether you are crafting your gift with a specific event in mind, or if you don’t know where to begin, we can help you decide the exact message you want your corporate gift to convey to its recipient and find the perfect way to do it. We are dedicated to meeting your needs on an individualized basis and making sure you are satisfied with the outcome of our efforts. If you are looking for a San Francisco custom corporate gift, contact the experts at Keith Lipert Corporate Gifts: click here to contact us or call (202) 965-9736.